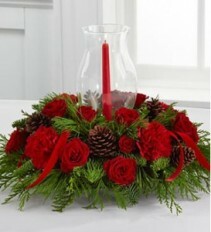 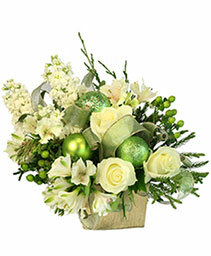 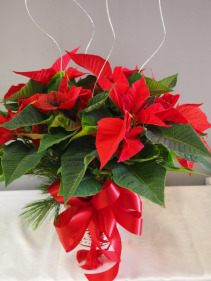 Festive centerpiece is set to lend its seasonal beauty to your holiday celebrations. Encircling 2 red taper candles, this lovely centerpiece will bring warmth and Christmas charm to your holiday gatherings with each graceful bloom. 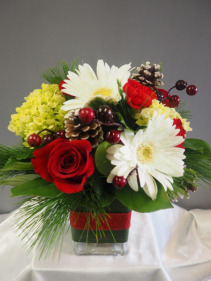 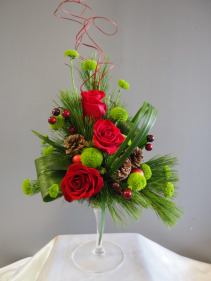 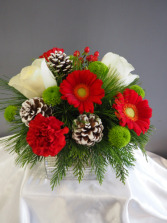 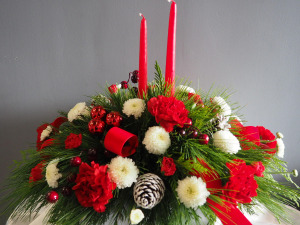 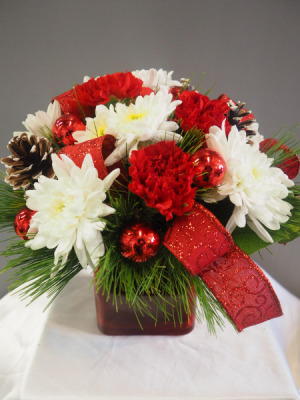 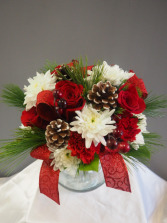 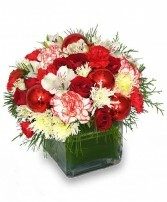 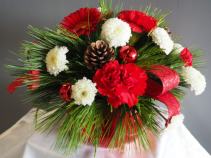 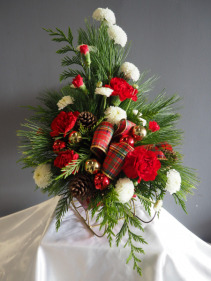 Bright red roses, carnations and mini carnations are arranged amongst an assortment of holiday greens, accented with natural pinecones and a designer red and green striped ribbon. Price 1: GOOD bouquet includes seven stems. Approximately eight inches high by twenty wide. 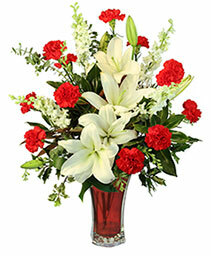 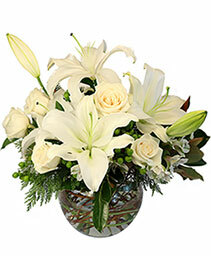 Price 2: BETTER bouquet includes 12 stems. Approximately 8"H x 21"W. Price 3: BEST bouquet includes 16 stems. Approximately 9"H x 22"W.
Festive centerpiece is set to lend its seasonal beauty to your holiday celebrations. 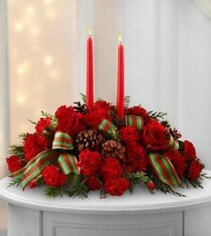 Encircling 2 red taper candles, this lovely centerpiece will bring warmth and Christmas charm to your holiday gatherings with each graceful bloom. 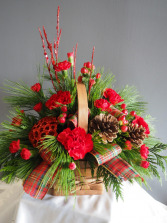 Bright red roses, carnations and mini carnations are arranged amongst an assortment of holiday greens, accented with natural pinecones and a designer red and green striped ribbon. Price 1: GOOD bouquet includes six stems. Approximately eight inches high by twenty wide. 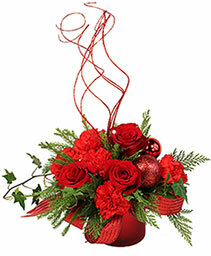 Price 2: BETTER bouquet includes 10 stems. Approximately 8"H x 21"W. Price 3: BEST bouquet includes 14 stems. 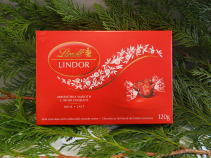 Approximately 9"H x 22"W.
Lindl Linder Milk Chocolate. 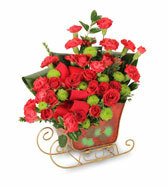 120g box This product only available on-line when ordering over $40 in a floral arrangement. 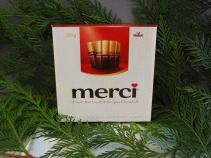 MERCI - Finest assortments of European chocolates. 400g box. 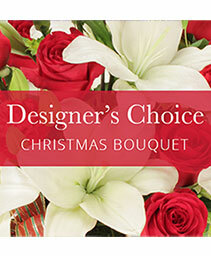 This product only available on-line when ordering over $40 in a floral arrangement. 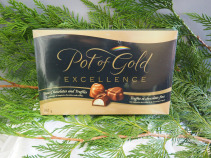 Pot of Gold chocolates. 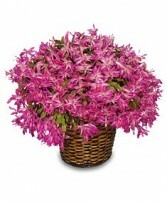 283g This product only available on-line when ordering over $40 in a floral arrangement.